Love the material. Very nice to wear and feels great. Very true to size. Provider of Quality Men's, Women's, and Children's Fashion Accessories since 2008. For customer service inquiries or to initiate a return, please contact TheDapperTie.com at dapperworld@gmail.com or (732) 390-2829. 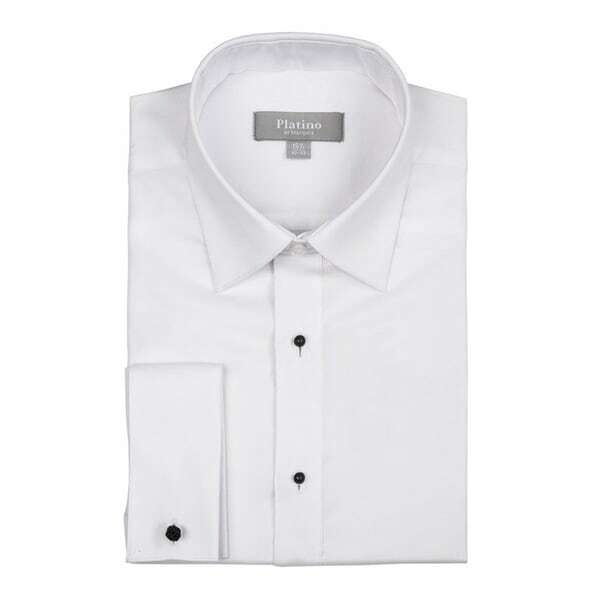 Marquis knows men's fashion-and so will you, when you're wearing this Elegant Regular Fit Spread Collar French Cuff Tuxedo Dress Shirt, something every man needs in his wardrobe. This shirt is made of a 100% cotton fabric which resists fading and is easy to care for. Once you try this shirt, you will never overpay again for similar, higher priced but lower quality shirts from big brand names and boutiques. Leave some cash in your pocket and look great, ensures that you feel as good as you look every time you put it on! This shirt comes in a great range of sizes. Great fitting shirt for formal wear. Button and cuff detailing is beautiful. The shirt only comes in white, but for formal wear this is fine. Needed an extra large size and the shirt came in sizes that accomodated our needs. Very pleased with the purchase. This shirt was ok. I thought textured ment it had pleats in the front ,but it did not. The fabric was not that soft. The knotted fabric cuff links were too big to fit through the holes of the shirt though. They were useless. Bought real cuflinks instead. This shirt is beautiful - what I didn't like was the cufflinks that came with it. They were like buttons and was hard to button. Otherwise, the shirt itself was very nice.